In one of the premier social events of the year, the Hudson County Chamber of Commerce honored four local “Legends’’ for their impact on the community at its Dec. 8 Legends Ball in Jersey City. Set against the spectacular backdrop of Liberty Science Center, the event honored Hoboken-based developer David Barry, Bayonne banker Thomas Coughlin, New Jersey City University President Dr. Susan Henderson, and the Mack-Cali Realty Corporation. The gala, according to Chamber chairperson Daryl Harrison-Rand, featured New Jersey University’s Jazz Quartet with students from both NJCU and Saint Peter’s University serving as volunteers and event hosts. The gala also marked the chamber’s 128th year, according to Maria Nieves, president and CEO. This year, the chamber increased its membership by more than 80 businesses, bringing its total to more than 600 countywide. “We have a goal of getting 1,000 members,” she said. With the Hudson Reporter serving as media sponsor for the gala, the event highlighted the achievements of four very successful people or organizations this year. Ironstate Development Company has deep roots in Hudson County and the New York/New Jersey region, managing more than 10,000 residential and hotel units, and has more than $1 billion in the pipeline for upcoming development. David Barry, president of Ironstate, has helped transform the Jersey City waterfront and downtown area with projects that include 70 Columbus, 18 Park, and other projects. The company also built the Shipyard development in Hoboken and housing around the state. Ironstate has also provided new facilities for the Boys and Girls Club in Jersey City. The company’s most recent Urby project is considered an innovation that creates community as well as a residential building. 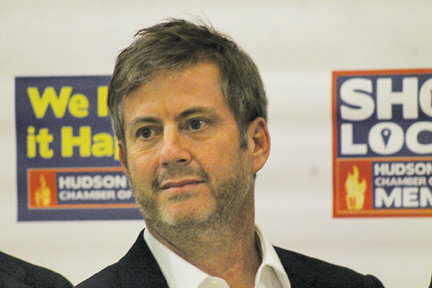 Thomas Coughlin, chief executive officer, president and chief operating officer of BCB Community Bank, is seen by some as a model “corporate citizen” for both heading one of the most successful banking stories in recent Hudson County history as well as for the bank’s support of charity and educational programs. A man who grew up and went to school in Bayonne, Coughlin received in B.S. degree from St. Peter’s University in Jersey City. Susan Henderson, the first female president of New Jersey City University, has been recognized for her vision of the school’s future and her successes since being appointed to her position in 2012. The school has expanded with a new 70,000 square foot business branch in Jersey City’s financial district, and Henderson is overseeing a $350 million expansion with the development of new western campus that includes student residence hall, academic building, performance arts center, commercial, and other residential elements. Representing Mack-Cali was Mitchell E. Rudin, chief executive officer. Mack-Cali has been involved with projects from the northern tip of the Gold Coast in West New York to most recently the southern tip of the emerging Gold Coast in Bayonne. The company has its headquarters in Harborside section of Jersey City, and through a newly established special improvement district, it is leading the way for creating a vibrant new community near Exchange Place.